Reviews and ratings give HGV-drivers and planning managers valuable information. How are facilities perceived? What is the state of the parking location? Is the rest area close to the highway or nice and quiet? Our app users come from all over Europe and drive in all directions. Therefor we receive thousands of reviews every year. These reviews on parking locations come in all kind of different languages. We help you understand these reviews and ratings by offering you an easy button: “Translate”. 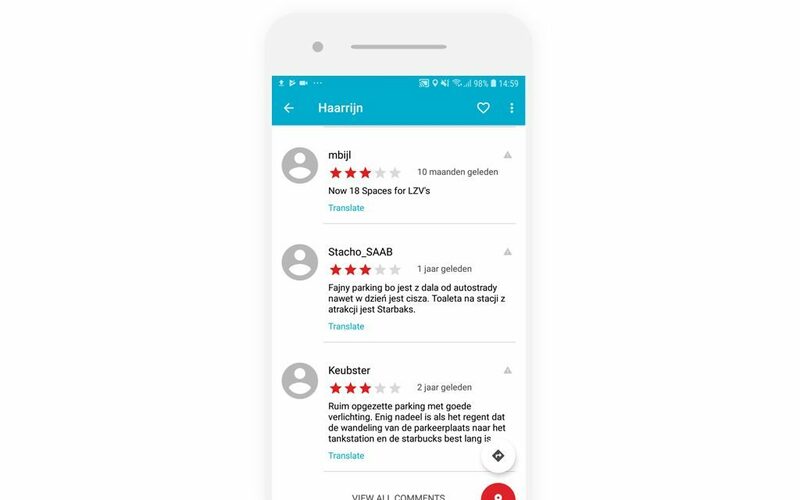 Auto translate any review in any language to the language of your choice! It is that simple. This way the Truck Parking Europe app provides you with even more valuable information to find the parking you need. Did you know that our app comes in over 10 languages? You can change your language by going to the menu > settings > language > choose your language.